Let me preface the following story by noting that I am a good driver. I have never had a collision with another vehicle and, despite my too-numerous-to-mention encounters with deer (which were completely out of my control) I still maintain that any children in my car are in no physical danger save for a headache from listening to Graham sing "Just the Way You Are" by Bruno Mars on constant loop. With that said, I have a bit of a problem with taking residential corners too tightly, especially when I am focusing on searching for a parking spot or directions to my destination. I wish I'd made that realization before we took a day trip to Des Moines to visit my sister, Sarah. Perhaps I could have saved myself a lot of hassle. Two weekends ago, Joel was scheduled to drive a couple of hours for a state jazz meeting, and because I had been wanting to visit my sister anyway, we decided to kill two birds with one stone. We arranged a place to meet, Joel jumped in her vehicle and went off to his meeting, and Sarah, her kids and I headed to lunch. Lunch was delicious. The conversation was grand. And with Joel's meeting running late, we even had time to sneak in a quick shopping trip to Target, because no woman can ever have enough nail polish or pumpkin scented candles. But after we'd made four or five circuits of the store and seen all we'd wanted to see, I began calling and texting my husband, knowing that Sarah needed her car and to get back to work. Eventually I got a text message with the address of the house where he was meeting, and I set my eyes to scanning for SW 7th St. A road sign buzzed by for 6th St., and realizing that we were heading in the wrong direction, I made a couple of right turns to try to backtrack toward the proper street. But when we finally reached it, two things happened. First, I realized that we were on the east, and therefore opposite, side of town. 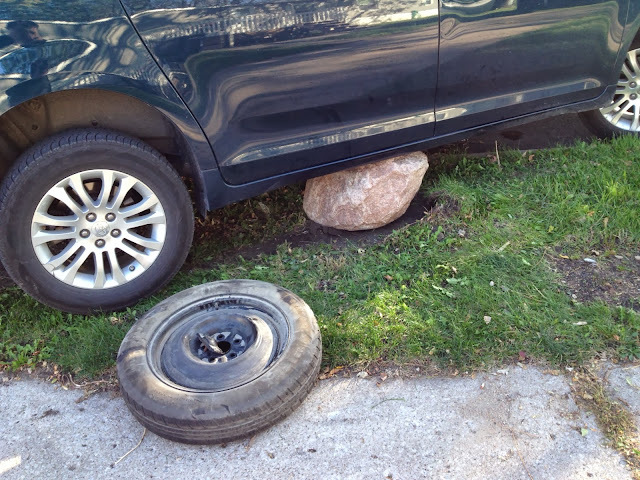 And second, I drove over a massive decorative boulder on the street corner. In my defense, these were curb-less streets, and the rock, which was significantly buried when I hit it, was positioned at the very corner, likely in an effort to keep people from taking the turn too closely. We went over it with a huge crunch, and in my shock I stopped the van, when in reality my momentum probably would have propelled us over the boulder. There would have still been damage, of that I have no doubt, but maybe I could have saved myself the $80 towing fee we would eventually pay. Before I called the tow truck, though, I tried driving forward and backward, shifting my tires to find a position that would give us some motion. Instead, when we thought we were finally making some progress, my spare tire broke loose and a loud hissing sound of air being released came from below the van. I resigned myself to having ruined my van while out of town, kids in tow, in the stupidest and most embarrassing way possible. I texted Joel, knowing that the interruption to his meeting was only the tip of the iceberg of my offenses that afternoon. As tactfully as I could without showing my panic, I let him know that there was a problem. And then my poorly performing phone crashed, but that was probably my fault, too. My clumsiness really knows no bounds. Joel's frantic calls and texts to me went unanswered, and those sent to my sister got the same treatment as her phone had died during lunch. Mercifully, my nephew Ryan had his phone along and fully charged, and I used that immediately to secure a tow truck and contact Joel. Over the next hour, a resident nearby tried to jack the van up enough to move the rock, but without the proper equipment, gave up trying just as my confused husband arrived. Soon after, the truck arrived and lifted the van enough for three men to move the boulder, which was now much higher off the ground after I'd unseated it from its previous location. Once back on solid ground, we were relieved to hear that the hissing sound came from the rear A/C line being punctured, and not from damage to our brake system or any other component that would keep us from driving home that night. After some very apologetic goodbyes, we headed home much later than anticipated, arriving in town just before a school-related bonfire that Joel was supposed to attend. Without time to head home, we stopped at Walmart to get ingredients for s'mores and to discover that Graham was serious when he said he had to go, and I spent the better part of 30 minutes disposing of his underpants after a very uncharacteristic accident.